Heat oil in a frying pan, Pan fry the salmon fillet skin side down till golden, then sear the other sides for approx. 3 min on each side, leaving the salmon a little pink in the middle. Break up into chunks and set aside. Cook pasta according to packet instructions in a large pot of salted, boiling water. Meanwhile, blanch the asparagus spears and the broccoli for 5 minutes then heat oil in a frying pan and quick fry on high heat, till tender and slightly charred. In a small pot, heat the olive oil and the butter over low heat. Add the garlic and cook till the garlic becomes slightly golden and translucent. Turn off the heat & add the chopped parsley. 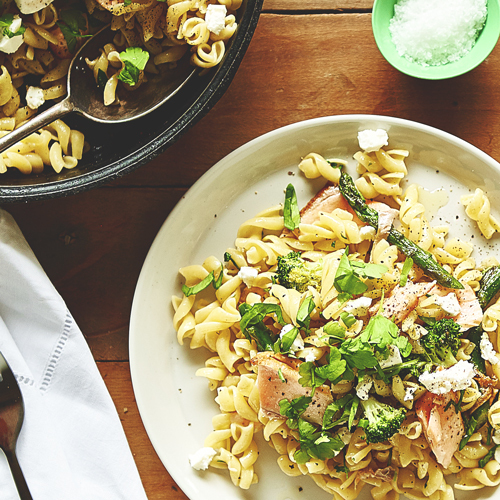 In a large serving bowl, combine the chunks of salmon, cooked pasta, asparagus & broccoli and the garlic butter sauce. Add crumbled goat's cheese and parsley to garnish. Season with salt and pepper.